Eleven-year-old Leanne is out of control. Since being taken into care at the age of three, she has had over forty placements, each carer less able to cope with her anger and destruction than the last. Late one night, foster carer Maggie Hartley receives a terrified call from Leanne's current placement, who has barricaded herself in her bathroom to protect herself from Leanne's rage. With the police on standby, Maggie manages to diffuse the situation but Leanne is left without a home once more. Maggie is Leanne's only hope. But this is her last chance. If this placement fails, she will have to be put in a secure unit. Then Leanne threatens Maggie with a knife and makes accusations against her that have to be investigated by Maggie's superiors. 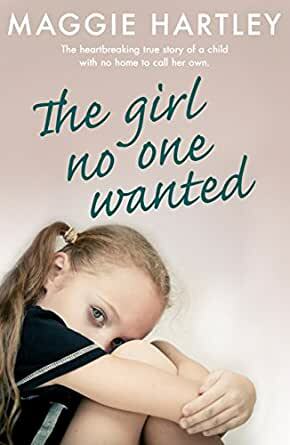 Where most others would simply walk away, Maggie refuses to give up on the little girl who's never known love. Can Maggie get through to Leanne and begin to help her heal? Will the girl no one wanted find her forever home? Maggie Hartley has fostered more than 300 children while being a foster carer for over twenty years. Taking on the children other carers often couldn't cope with, Maggie helps children that are deemed 'unadoptable' because of their behaviour or the extreme trauma they've been through. She's looked after refugees, supported children through sexual abuse and violence court cases, cared for teenagers on remand and taught young mums how to parent their newborn babies. Lost Daughter: A Daughter's Suffering, a Mother's Unconditional Love, an Extraordinary Story of Hope and Survival. 5.0 out of 5 starsGreat short read, well written ! Great reading, hard to put down, brings me to tears everytime as i look for more happy endings! Maggie is a blessing to these children. This touched me personally. I was in fifteen homes in ten years. I was a problem child. I saw my own struggle in Leanne. All I wanted was to be loved. But my early life taught me mistrust, guarded behavior and then pushing people away before they could reject me. It was so hard when I would let my barriers down, only to be shunted aside because they wanted a baby or hadn't realized how difficult fostering can be. I admire Maggie Hartley so much for her sheer compassion and keen insight, combined with her witty writing style and aplomb with difficult children, authoring books that wrench tears and joy and living a life of love. One cannot read her true life stories without feeling humble and glad they read it. She is a force unto herself and is to be commended for her real commitment to the disenfranchised of this world. I love Maggie's books but they are very hard to get as amazon thinks its funny to block the UK from the US people . Or it feels like it as I have trouble getting Casey's books as well. I will not understand as they will not explain the reasons it takes 6 months after book is out to a few book have taken 2 years for the buy now tab to turn so I could buy, I always says NOT AVALIBALBE IN THIS AREA. 5.0 out of 5 starsGreat Read!! This book was a very interesting read. Maggie held my interest from the beginning too the end. This just goes to show how with commitment and dedication that a child's behavior can change and give them a fresh start in life. I would recommend this book to others without a doubt. Reminds me of working in an orphanage and all the boundary testing, shin kicking, craziness of being a carer. Great author. Everything she writes is terrific. Excellent read. It kept my interests from start to finish. It is great to see how such a hurt child can change for the better.